So the rumors of my disappearance are not true- except for perhaps our quick getaway to England last week (another whole posting I promise! 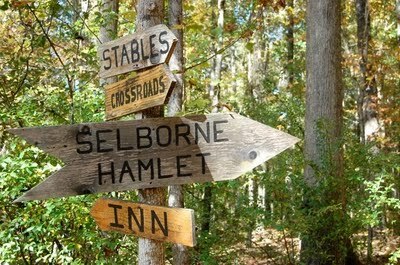 )- and I am back to the tales of the wonder that is Serenbe. SO much has gone on and I will hope to get it all written down. I did want to let everyone know that the next chef for the Serenbe Southern Chef series will be at here July 11 and 12. Ford Fry of JCT kitchen is bringing his deliciously simple and fresh Southern cuisine to my kitchen next week. For those of you who have dined at JCT, you know what a treat this will be. Plus, Serenbe Farms is at the height of vegetable season so I know Ford will be working wonders with all of Paige’s delicious produce. There are a few spaces left. 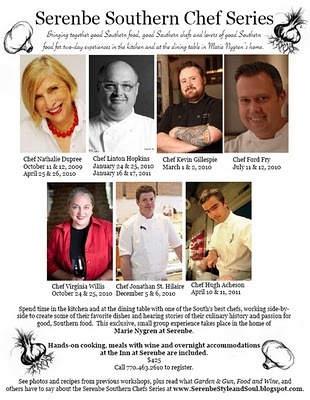 Call the Inn today, 770.463.2610 to reserve a great last minute culinary getaway with one of Atlanta’s best chefs. 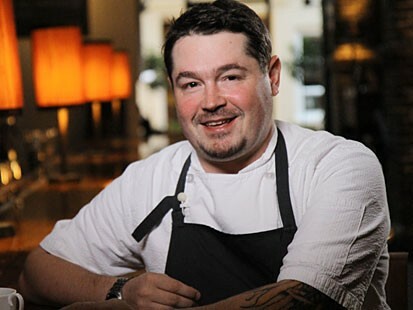 Read more on Atlanta Dish! Hope to see you next week in my kitchen. Along with the spring flowers popping out of the ground, we have new businesses opening at Serenbe. Repurpose , a new venture for Keith Robinson of Gloriosa Design, is an amazing treasure of a store. Filled with beautiful antiques, paintings (some from Serenbe residents), fresh flowers for purchase and treasures Keith has found, Repurpose is a beautiful spot to visit at Serenbe. Garnie, our oldest daughter, and I approached Keith some 7 weeks ago about the potential of the shop. 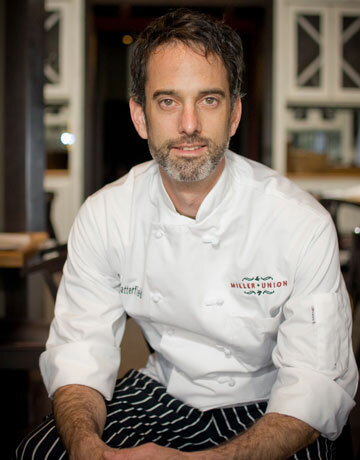 We have known Keith for several years as he is the exclusive caterer for events at The Inn of Serenbe and love his style and design eye. 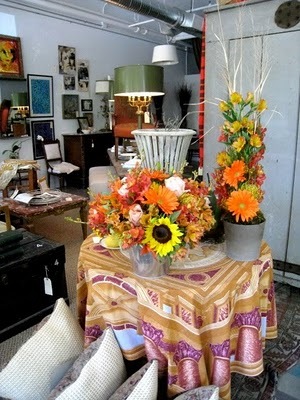 A shop space was coming available and Keith had an inventory of beautiful furniture and objects from his years of styling events that his storage space was overflowing with. He loved the idea as we found out that one of his dreams for years had been to own a “lifestyle” store. Well as is Keith’s way, he transformed a store space in 5 days! I love walking up to Repurpose to see what new piece Keith has recently found. He has an uncanny ability to find items. I have known him to see a piece of furniture on the side of the road that has been discarded and bring it back to life. 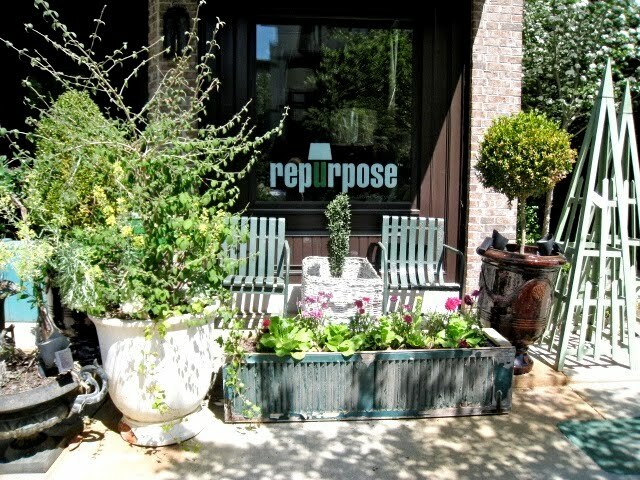 Hence the name, Repurpose. 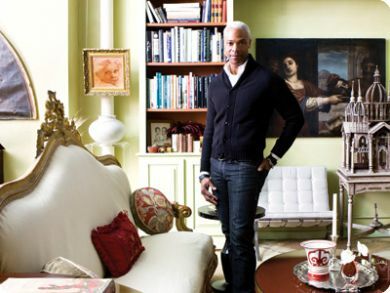 In this month’s Atlanta Homes and Lifestyles, there is a story featuring Keith and his exquisite style. I hope you’ll come to Serenbe this weekend or soon to visit his shop and take home a treasure for yourself. I am so excited today! 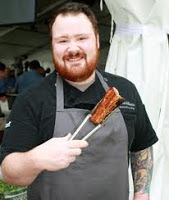 We just began to publicize our newest addition to the Southern Chef Series, Kevin Gillespie from Woodfire Grill and Top Chef when yesterday we were featured on a posting by Garden & Gun’s blog Talk of the South. And today we are SOLD OUT for Kevin and Linton Hopkins is very close to being filled up as well…only one opening left for him. Wow, I didn’t even have time to get Kevin listed on my blog before he sold out…. so amazing. Click on picture to see full size press release. There is still time to sign up for other chefs in our series. We can also add you to a waiting list in case we have any cancellations for Kevin. Call 770.463.2610 for reservations. Because of all the interest in our series, yesterday I also had the most amount of one day hits to the blog than ever before!! !…….754 for one day. I hope all of my new readers continue to follow….. lots more fun things to come. As the holiday rush continues Marie is prepping in the kitchen for 150 reservations for Sunday’s fried chicken lunch at the Farmhouse. 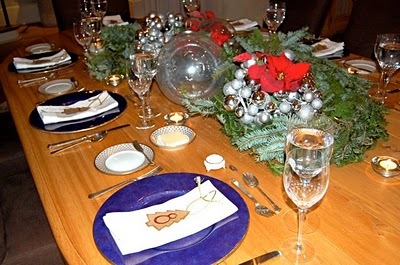 Because of this, I am filling in for a couple of days as a guest blogger and am excited to tell you about the Nygren’s family Christmas dinner tradition. 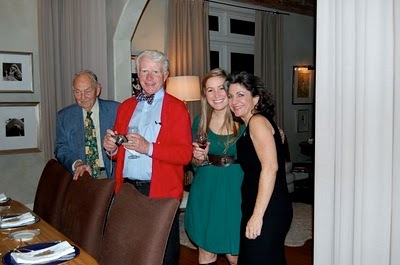 A small group of close friends joined the Nygren family last night to enjoy Christmas dinner. The house was magical with decorations everywhere, and two beautifully set tables courtesy of their friend, Stan Topol. Before dinner began we were asked to pick a number and then choose the seat which matched our number. What a fun way to meet new people. After tasting it last night for the first time I fully understand why that question was asked. It was one of the best soups I have ever had. I had asked Marie for other soup recipes in the past and she told me when she and her mom cooked soup they always “just added a little of this and a little of that”. 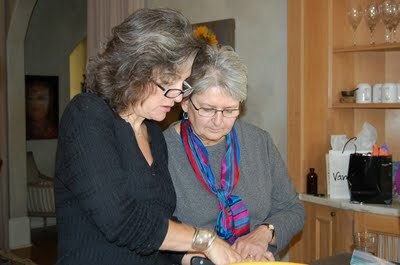 This soup was so popular that they finally sat down to create the recipe which is now featured in Margaret’s cookbook. 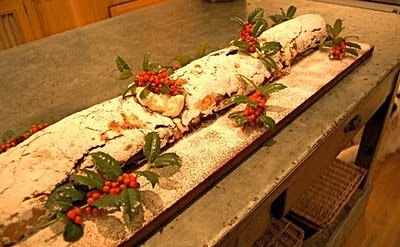 (it will also be served on New Year’s eve at the Farmhouse). The next course featured beef tenderloin with Marie’s homemade horseradish sauce, scalloped potatoes (my personal favorite), butter pea and kale gratin, parsnips, leeks and homemade bread. Dinner was delightful, conversation was lively and the dessert presentation was amazing. 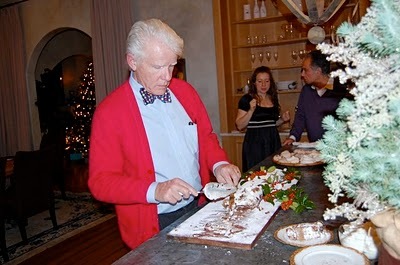 Every year Steve and their youngest daughter, Quinn make the yule log, buche de noel and meringue cookies. The log reached almost the entire length of the kitchen island and it was truly a work of art! It is obvious that tradition plays a treasured role in the Nygren family and with a picture perfect Christmas dinner, it is a tradition that I hope I continue to be a part of every year. 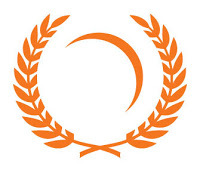 I am excited to announce the winner of November’s recipe contest featuring Sweet Potatoes. I received many wonderful recipes so again I thank all who participated. Sent in by Tina Collins Eib, the combination of ingredients makes this one a real treat sent. Cut potatoes and fruit (omitting cherries) into bite-size pieces then cook potatoes first on med.-low heat in the butter until nearly soft, but slightly firm. Add the apples and pears sugar, cinnamon, nutmeg, and cherries and continue cooking on medium heat, stirring often, for about 5 minutes, or until dried cherries have plumped and apples are nearly soft, but retain some firmness. Stir in pecan pieces. 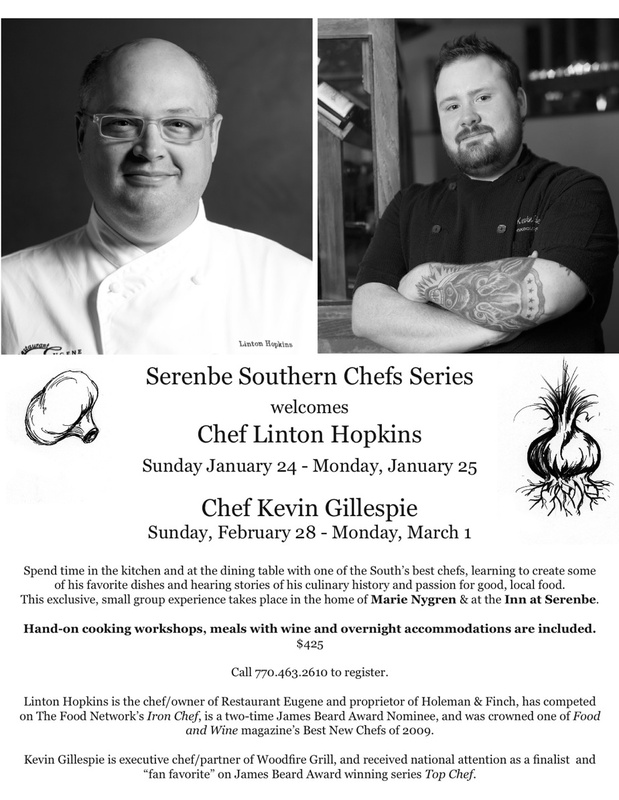 I am very excited about our second event in our Southern Chef Series. 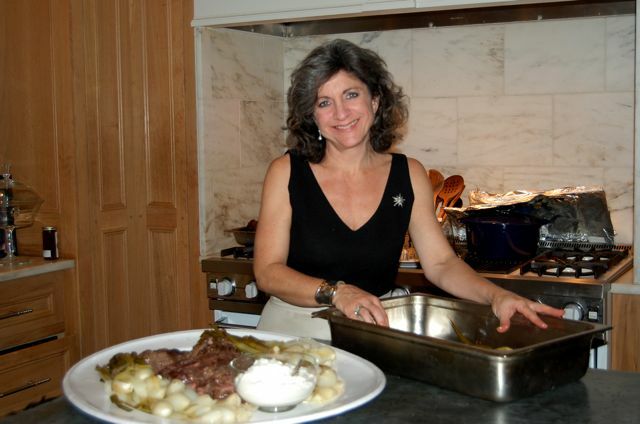 Our first of the series with Nathalie Dupree was such a great experience and I am so looking forward to having Chef Linton Hopkins here in my kitchen and sharing that time with an intimate group of guests. We are welcoming Chef Linton Hopkins on January 24 & 25 to our community of Serenbe. 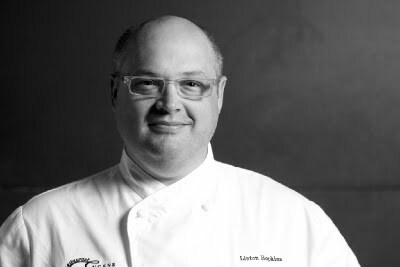 Spend time in the kitchen and at the dining table with Chef Linton Hopkins, learning to create some of his favorite dishes and hearing stories of his culinary history and passion for good, local food. 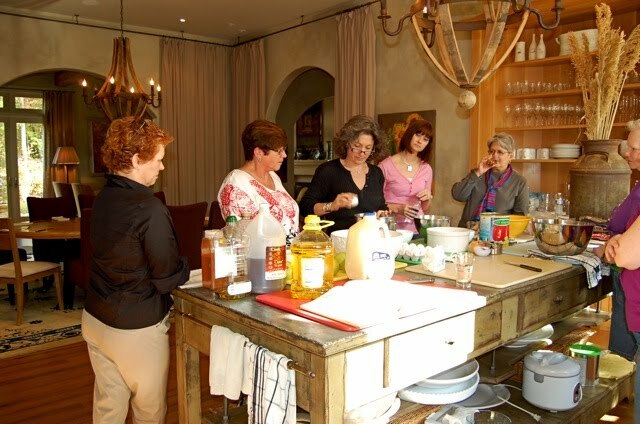 This small group experience takes place in my home and at the Inn at Serenbe. Linton Hopkins is the chef/owner of Restaurant Eugene in Atlanta, has competed on The Food Network’s “Iron Chef,” is a two-time James Beard Award Nominee, and was crowned on of Food and Wine magazine’s Best New Chefs in 2009. He is also proprietor of Holeman & Finch and H&F Bread Co in Atlanta. For details and reservations, call 770.463.2610. I look forward to you joining us. 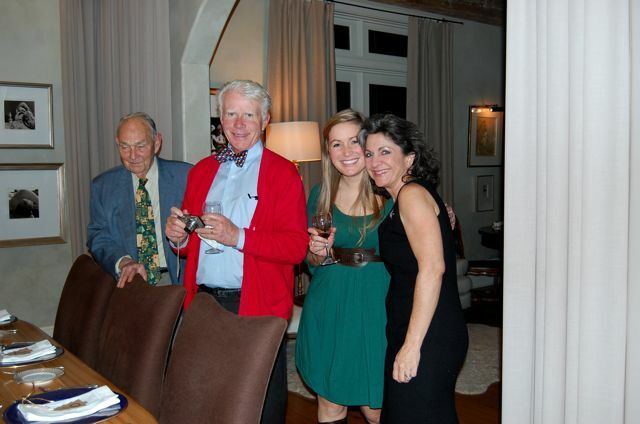 The holidays are quickly approaching and it is a wonderful time to be with us in Serenbe. We often hear residents and visitors say they love “stepping off the treadmill of life” and enjoying the calming relaxing feeling Serenbe provides, which makes the holiday season a perfect time to visit. While here it will be a great way to kick off your holiday shopping in our unique shops. And don’t forget to stop by our galleries. We have two art galleries and a photography studio for your enjoyment. 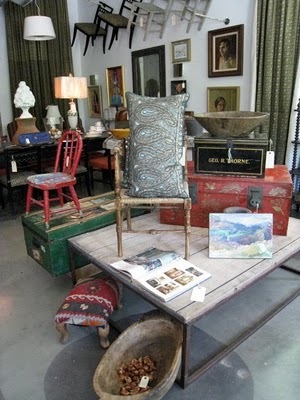 Click “shopping” to see the shops of Serenbe. After your day of shopping, enjoy a relaxing walk around the community, our nature trails and a visit to see our beautiful farm animals. To end your day of relaxation on a perfect note, enjoy some time in our newly opened Blue Med spa or the chance to have your hair done in the Paisley salon. 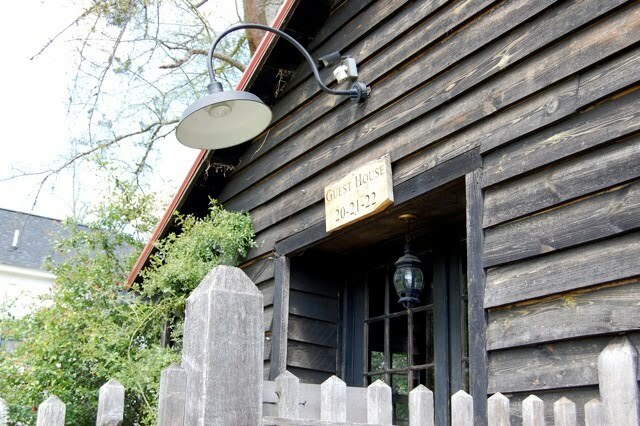 For Thanksgiving we would love you to join us as we serve you a traditional holiday dinner at the Farmhouse restaurant while providing an intimate, relaxed atmosphere in the historic main house of the Inn at Serenbe. 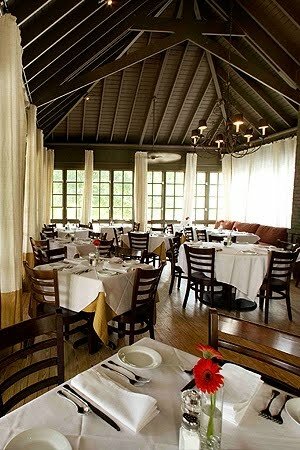 If you would like to join us, call 770.463.2622 for reservations. Our hours are 11 am- 7 pm. 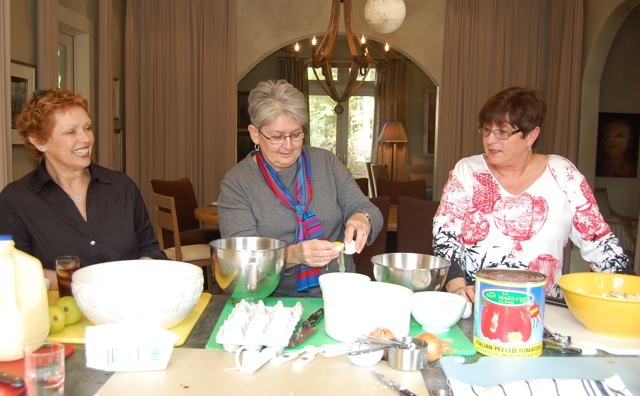 A wonderful day of cooking was in store for a group of volunteers from Good Mews Animal Foundation. 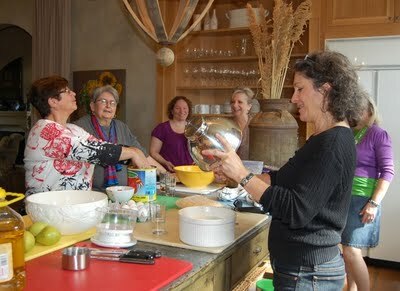 Good Mews is a non-profit, no-kill, cage free shelter for cats in Marietta and when my friend Dana asked if I would arrange a cooking day for some of the volunteers, I knew we would have great fun. 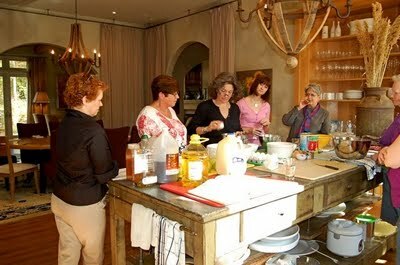 My usual menus always include southern cooking but we decided to go for something different for this group of friends. The menu included 2 pasta dishes; linguine with caramelized onions, mushrooms and parsley and penne with corn, tomatoes and caramelized onions. We also made homemade bread, cheese soufflé, arugula salad, and blueberry cobbler for dessert. I couldn’t let the day pass without teaching the beauty of adding caramelized onions to a dish to add a special twist. We even cooked scrambled eggs with the onions for everyone to sample and then added a small amount of cider vinegar for an added twist. I think everyone would say it was a fun and delicious day. 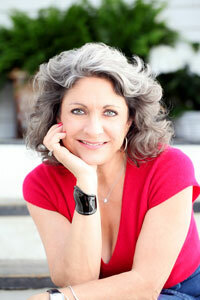 Click onto all of my links for the recipes to some of the days treats. Wash 6 cups arugula and dry. Place greens in large salad bowl. Slice pears and add to greens. Toss salad with vinaigrette. Top with pecans and blue cheese. Note: Granny smith apples may be substituted for pears. Serves 6. A winner from November will be announced shortly! Sorry, I am behind with so many holiday activities that I have yet to pick a winner from November. As soon as I try all the recipes, a winner will be announced. For the month of December, I am not asking for a featured ingredient. 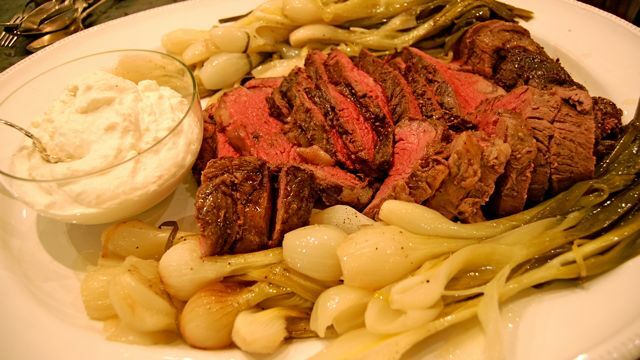 This month I would just love to see your favorite recipe you serve as a side dish during the holidays. Possibly one you whip up for your family or for your neighborhood party. Be creative and have fun. After all, it is the holiday season! 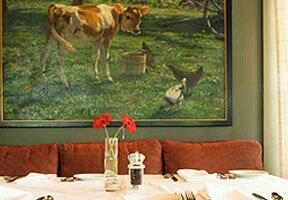 Remember, as the winner of the contest, you will receive dinner for two at the Farmhouse and your recipe will be featured on my blog and as part of the menu at the restaurant. I will be accepting new recipes until December 30th so keep them coming!